On a gloriously sunny day in May we rang the doorbell of ichthyologist Martien van Oijen’s home in Leiden for a rather peculiar project. Even though the original plan had been to carry it out in a laboratory setting, on account of the beautiful weather we all agreed to move the project outside. 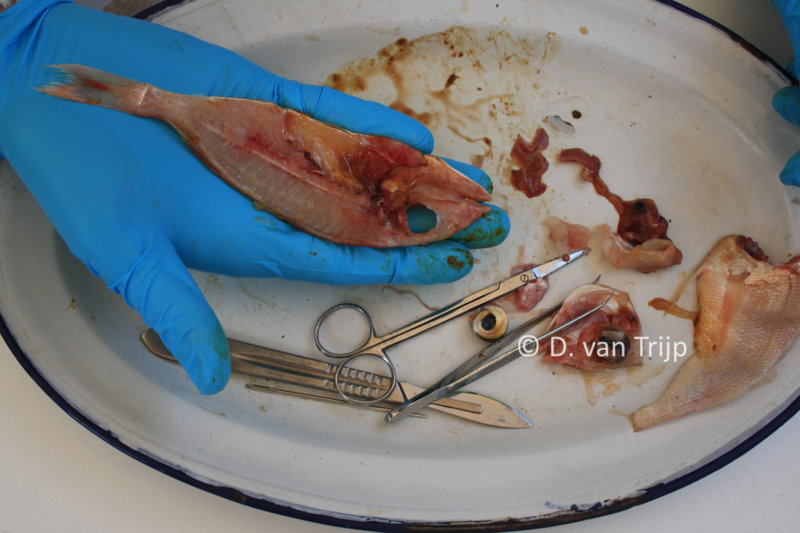 In his garden, Martien had set up a table on which had been placed an array of equipment for dissection together with some specimens of red seabream that he had bought at the fish market that morning. The reason for all this? The replication of an eighteenth-century recipe for preserving fish skins. 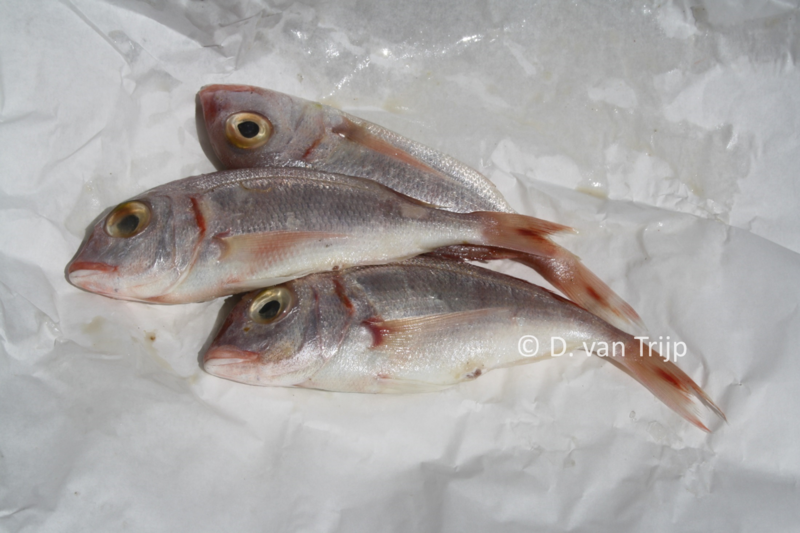 The freshly bought breams. All images courtesy of the authors. We set out to replicate Gronovius’ method step by step, carefully documenting each act with photographs and taking extensive notes along the way. The first order of business was to cut the fish open with a pair of scissors, while making sure that the fins were not accidentally destroyed. Cutting the fish open. All images courtesy of the authors. Then most of its right half and all of the intestines were removed, which resulted in a rather gruesome sight. Completely dissected. All images courtesy of the authors. Then we washed the left half and patted it dry with a linen cloth. After spreading the fins with pins, we exposed the half fish to the sun so that it could dry further (in the absence of sun, Gronovius recommended exposing it to the hearth). Spreading the fins. All images courtesy of the authors. We noticed fairly soon that some of the steps were not entirely clear to us. 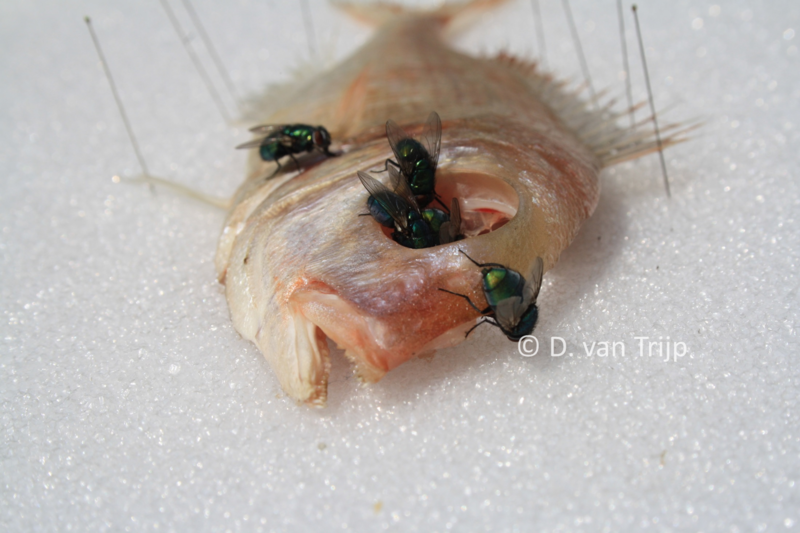 For one, what to do about the impressive swarm of flies that instantly flocked to the carcass once it was laid out to dry? Swarming flies. All images courtesy of the authors. Most importantly, although Gronovius said the skin could be separated from the flesh “with very little trouble” after the drying step, it took considerable effort to do so. This may have to do with the fact that some of the steps are described in a somewhat ambiguous manner. We interpreted the step telling us the “back-bones are then to be cut asunder” to mean that the backbone should be cut but not removed. Drying the inside of the fish. All images courtesy of the authors. After drying, however, these bones were very hard to remove, so we now think the entire backbone should be discarded before the drying step. Subsequent attempts with new specimens should shed more light on these issues. 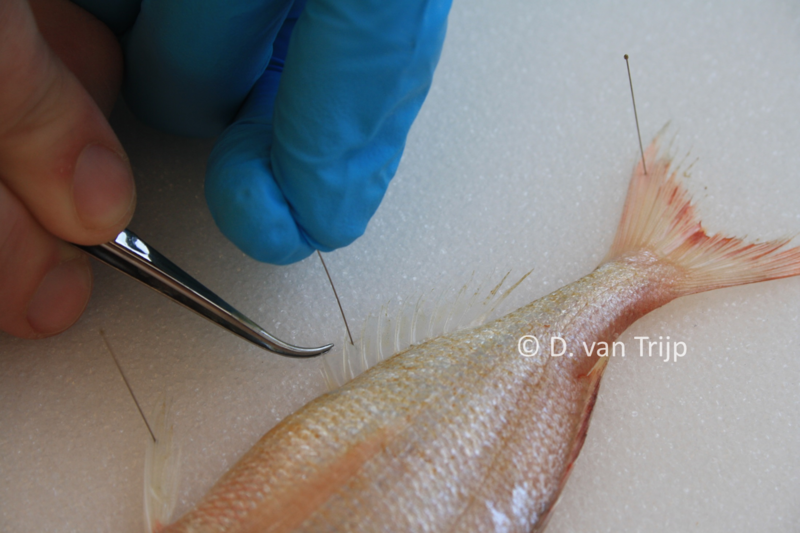 The replication of this method is proving to be very insightful by giving us first-hand experience with a pertinent aspect of our respective projects: the preservation of fish specimens so that they could be collected, circulated, stored and classified. Fishes were notoriously difficult to preserve, losing their shapes, colours, textures, and often spoiling despite the collector’s best efforts to prevent these processes. So far, Gronovius’ method has indeed proven to be very quick and remarkably doable, and it appears to preserve the fish in very good shape, although we are not quite done with it yet. 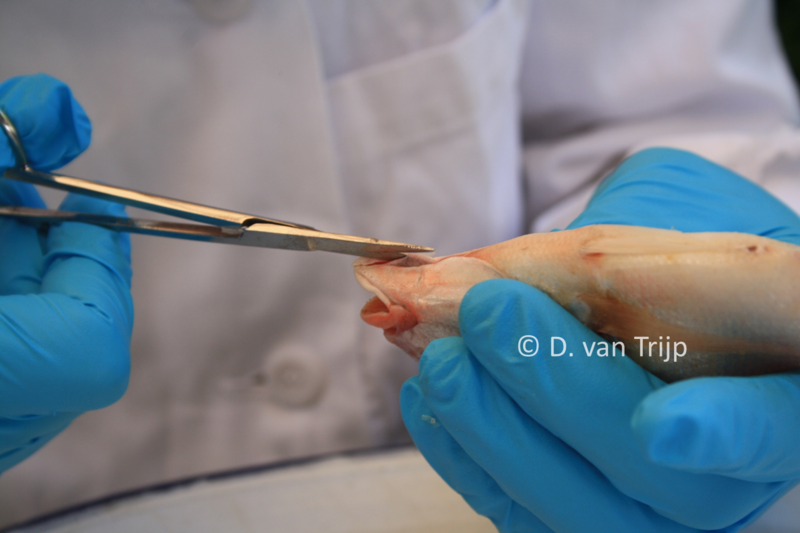 After removing the dried flesh, the skin was placed between paper and left under a press overnight. 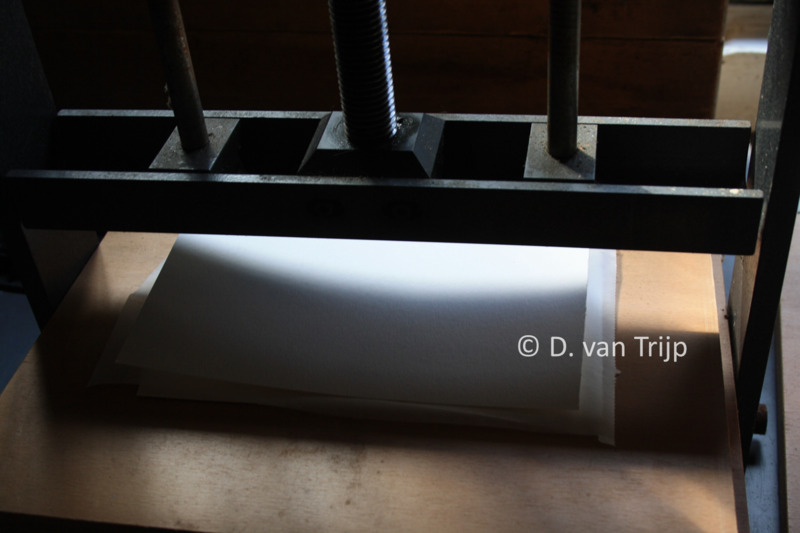 Pressing of fish skin between paper. All images courtesy of the authors. 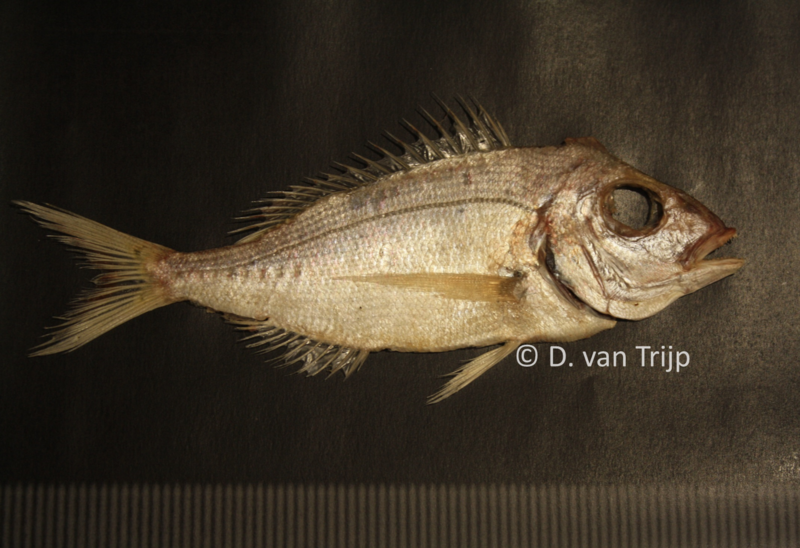 The next morning an elegantly flattened half-fish came out that would have done Gronovius proud. Result (sans varnish). All images courtesy of the authors. Unfortunately, it did not smell quite as good as it looked. Our next step will be to use the recipe for a particular varnish that has been written up by Gronovius in a letter to one of his correspondents after having received a number of rotting fish skins. If all goes well, this should remedy the stench of the specimen – now safely stored in the freezer awaiting further treatment – and keep it in its current unspoilt state for many decades. 1 J.F. Gronovius, ‘A Method of preparing Specimens of Fish, by drying their Skins, as practised by John Frid. Gronovius M.D. in Leyden’ in Philosophical Transactions 42 (1742) 57-58. Robbert did the dissecting, Didi the documentation.